In a triangle ABC, X is a point on BC and AY is the bisector of the angle CAX as shown in the figure. 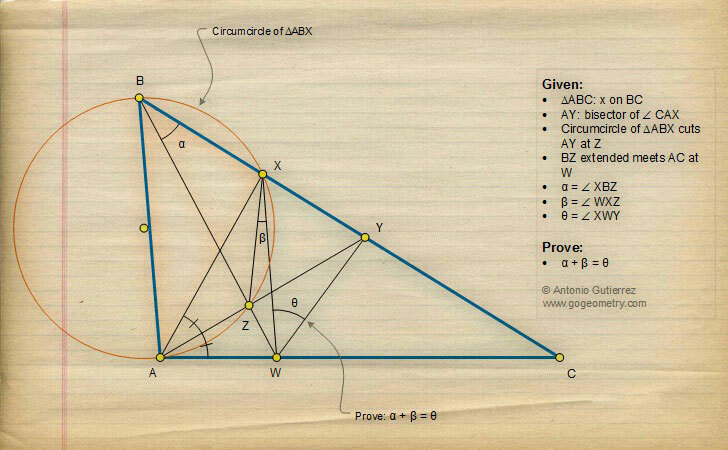 The circumcircle of the triangle ABX cuts AY at Z. BZ extended meets AC at W. Prove that angle XBZ + angle WXZ = angle XWY. This entry contributed by Sumith Peiris, Moratuwa, Sri Lanka.